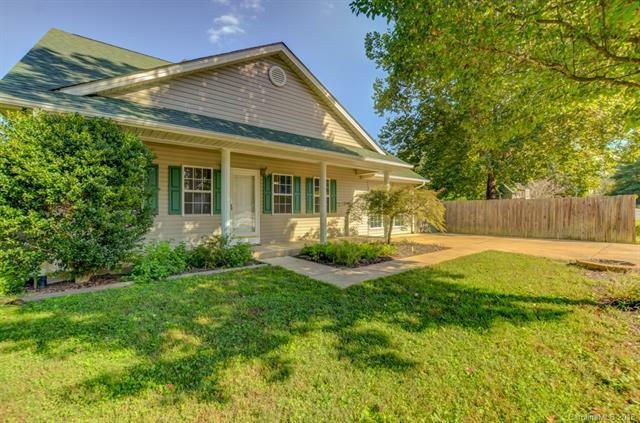 Cute 3 Bed 2.5 bath home on 0.37 acres. Home warranty included. Beautiful LEVEL tree shaded yard with fenced areas perfect for pets and has a play set. The big newly constructed deck and spacious yard make this home perfect for outdoor living. It has an open living room with vaulted ceilings, rich wood laminate flooring and 2 gas fireplaces. Main level features master bedroom with en suite bath, kitchen with ample storage space, breakfast bar and separate dining area. The large family room on main floor has separate entrance and half bath making it perfect for a home based business. Upstairs has two additional bedrooms featuring "Jack and Jill" bath PLUS a bonus room with fireplace could be used as den/office or extra bedroom. This great corner location has access from both streets. Close to Fletcher Park, short drive to South Asheville and convenient to Hendersonville.